This gift certificate will please. And can be used immediately. WOW! Are you after a cool prezzie or gift for someone and not sure what to get? Well this cool gift certificate is for you. This $100 gift certificate will please even the most hardest to buy for geek in your life. And its easy to use too. Yep, with this gift certificate your friend or family member can select from our cool range of gadgets and then get'em delivered straight to their door. What better way to show you care. Gift certificates are delivered via email and get sent out directly to the receipient the moment your order has been processed or you can schedule it to go on a certain date. 1. Gift certificates and unused portions of gift certificates should be spent within 12 months from the date of issuance, which is the "spend by" date included on the gift certificate. Gift certificates will expire 12 months from the date of issuance, which is the "expires" date included on the gift certificate. 2. 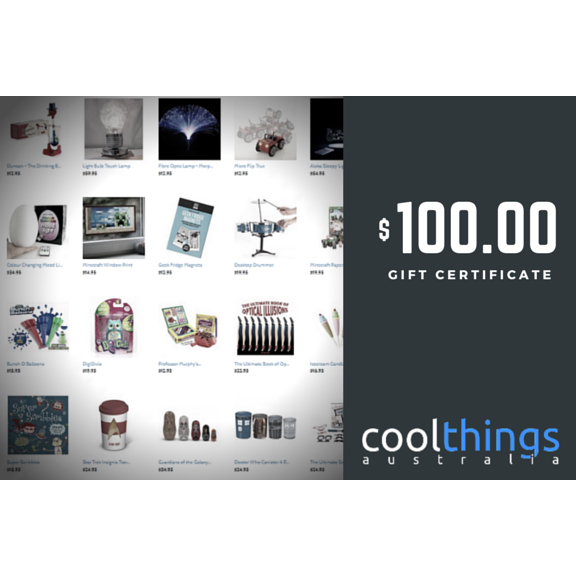 Gift certificates must be redeemed through the coolthings.com.au Web site, toward the purchase of products listed in the online catalogue. 3. Gift certificates cannot be used to purchase gift certificates or gift cards, such as coolthings.com.au Gift Certificates and cannot be used with free offers. 4. Gift certificates are not redeemable for cash and cannot be returned for a cash refund. 5. Any unused balance will be placed in the recipient's gift certificate account can be used at any time up until expiration or can be transferred to another person via email. The original expiration date will apply to any unused balance. 6. If your order exceeds the amount of your gift certificate, you must pay for the balance with a credit card. 9. Coolthings.com.au will have the right to close customer accounts and request alternative forms of payment if a fraudulently obtained gift certificate is either redeemed through the coolthings.com.au Web site or is redeemed and used to make purchases on the Coolthings.com.au Web site. 10. Coolthings.com.au may provide gift certificate purchasers with information about the redemption status of gift certificates. 11. Coolthings.com.au reserves the right to change these terms and conditions from time to time in its discretion.